1) Traditional Guided Sea Kayaking Tours. One these tours, we launch from shore near Marco Island, Everglades City or Chokoloskee Island to paddle/camp the 10,000 Islands, Everglades National Park and/or the Wilderness Waterway. Tours can be a "loop" trip where we return to the same launch site or a "one way" trip where we launch at one location and are picked up at another. 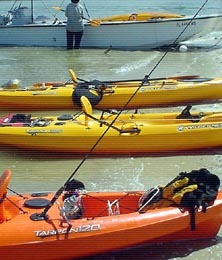 2) Boat Assisted (Base Camp) Kayak Tours. On these tours we use a power boat to transport the kayaks, our guests and gear to a remote location where we setup a base camp typically on a remote island beach. From the base camp, we make daily paddle excursions to areas that most paddlers simply do not have time to get to and few have experienced. With boats, we can avoid long paddles and bad tides, bring more amenities/gear, control departure/return times and better choose sites more conducive to weather, winds, fishing, wildlife, etc. PRIVATE TOURS. Many of our multi-day experiences are reserved as private tours for families and groups. We do need, at least, four guests (or the fees of four guests) to book a tour private. OPEN TOURS. We also conduct many "open" tours so that singles and couples may join other like-minded paddlers to experience the Everglades. IMPORTANT! We can accommodate most any departure day and duration. Just let us know what works for you. WHAT DO YOU NEED? Not much…a back pack with your personal stuff. We take care of everything else. All you really need is your clothing and personal items. When you make a reservation, we will email you a confirmation package that includes a packing checklist. This helps us both be prepared for your experience. The three-day tours are, by far, the most popular. You can reserve these experiences directly online. For other durations, please give us a call. We can have significant tidal currents near the full and new moons. These currents can have an adverse impact on paddle times and exertion. To minimize the impact and paddle with the tidal flow, book a traditional sea kayak tour departure within two dayseither side of the FIRST or THIRD quarter phases of the moon. With an early start, you will paddle with the tide (not against it) to your first campsite. The afternoon of the last day, you will ride the tidal flow back home ... easy relaxing paddling! Please know that we do have a minimum of guests that is needed to conduct a tour. Rarely is the minimum an issue. However, if it is we have many options to offer and will contact you in advance to discuss each. 3-Day, Boat Transported, Kayak "BASE CAMP"
From October to May, we host 3 day/2-night boat transported camping/kayak experiences most every weekend. We leave early Friday morning and returning Sunday afternoon. We use the transport boat to bring our guides, gear and guests to remote locations. This allows us to bring along more amenities and avoid long paddles to our destinations. These trips are particularly suited for families, fishermen and photographers. HOWEVER, we can departure most any date, so PLEASE CALL or email and will put together a date that works for you!